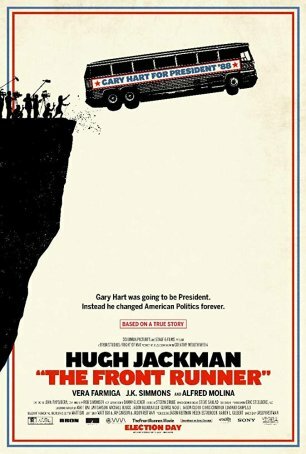 The Front Runner attempts – and partly achieves – two goals: to provide a chronicle of events leading to the downfall of one-time Presidential candidate Gary Hart and go illustrate the power of the press to do harm. While there have been numerous motion pictures devoted to lionizing journalists in their quests to illuminate the ugly things that lurk in the shadows (All the Presidents Men, Spotlight, and The Post come to mind), this offers a rare contradiction. The unanswered question, which has remained unanswered for thirty years, is whether Hart was a victim of his own libido and carelessness or whether he was chewed up by a ravenous press more interested in sensationalism and tabloid journalism than truth. From a news perspective, The Front Runner offers nothing new. The record hasn’t changed since Hart bowed out of elected politics in 1987. He continues to maintain that his relationship with Donna Rice was platonic and that the “affair” was concocted by the press. The Front Runner, based on the book All the Truth Is Out by Matt Bai (who co-wrote the screenplay), neatly sidesteps the question of whether Hart slept with Rice by not documenting their interaction. There is room for doubt and because the newspaper forges ahead while ignoring the possibility of innocence, they are painted as the villain in the Hart saga. Ben Bradlee, the unquestioned hero of The Post as played by Tom Hanks, is treated less magnanimously in The Front Runner (here, he’s portrayed by Alfred Molina). He’s more interested in being first than in whether there’s truth in what he’s printing. The central story focuses on the dramatic rise and stunning fall of Gary Hart (Hugh Jackman), a Colorado Senator who takes his 1984 Democratic primary war with Walter Mondale to the convention (where he loses his bid to be on the ticket that Reagan/Bush trounced) then returns as the front runner for the next cycle. When Hart first announces his candidacy, he is considered the odds-on favorite to go up against presumed Republican nominee George H.W. Bush. But, in the span of three weeks, Hart slides from the apex of a political mountain into an abyss of shame and self-recrimination. He loses his grip on the nomination when newspapers post a salacious story about his possible affair with a much younger woman, Donna Rice (Sara Paxton), who is seen entering his Washington D.C. home and not leaving. (Hart claims she didn’t spend the night but left by the back door – an exit the reporters weren’t watching.) Hart withdraws from the race after the press’ treatment of his wife, Lee (Vera Farmiga), and daughter, Andrea (Kaitlyn Dever), becomes intrusive, bordering on abusive. Rather than continuing to subject his family to this, he steps down while issuing a warning – if journalists persist in attacking candidates, the worthy ones will bypass public office and Americans will be left with the dregs – egomaniacs and self-serving bureaucrats. For those who lived through those messy times, the movie plays out largely as expected with few revelations or surprises. The Front Runner broadens the canvas by presenting glimpses of other perspectives: Gary’s wife, Lee; his campaign manager, Bill Dixon (J.K. Simmons), and various newsmen covering the story. Donna Rice is thinly sketched at best – an attractive but timid young woman unprepared for the tsunami of coverage that buries her. Hart comes across as rigid and moralistic – traits that make the character seem out of touch and a little unsympathetic. Although I remember Hart, I can’t say with assurance whether Hugh Jackman effectively captures his mannerisms or speech cadence. The physical resemblance is passable although imperfect. The actor is good enough to be convincing but he is outshone by Vera Farmiga who leaves a deeper impression despite having less screen time. One is left wondering whether the more compelling story might have been to present The Front Runner entirely from her point-of-view. Too often, we don’t know what Lee is thinking but, in Farmiga’s most riveting scene, we have no doubt whatsoever. History has recorded Hart’s aborted campaign as a blip. He’s an interesting but ultimately unimportant figure. His story becomes interesting when compared to how things are today. Were his warnings about an unchecked press prophetic? Has Trump’s attitude toward journalists been informed by Hart’s treatment? The movie, like the man, seems destined for obscurity. It’s well-made but uneven and its most compelling arguments are unfinished. The Front Runner is a less a film for general movie-goers than for political junkies.